Each year the BMW Car Club of America throws a party—a world famous party known as Oktoberfest and sometimes simply O'fest. This movable celebration of everything BMW occurs at exciting locations throughout the country and is the ultimate motorsport family reunion. Shell V-Power NiTRO+ is the Official Fuel of Oktoberfest, and with that partnership comes a host of unique activation opportunities. With a dynamic mix of assets throughout the five-day event, Shell spoke directly to its ideal performance and premium-minded customer in a natural way where they already were. The brand also enhanced the BMW CCA membership experience in a variety of ways with gas card awards, driving opportunities, technical education, and much more. All of this covered by media, car club members and the Network of Champions in an organic way. The 2018 BMW CCA Oktoberfest was a big success for the club, the members and the partners. 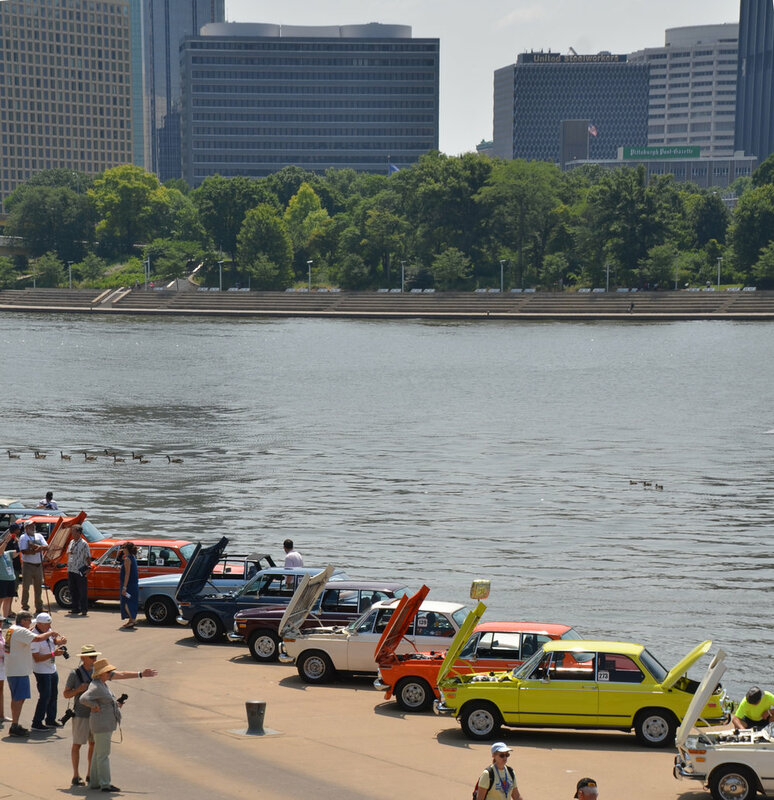 Over 1,200 attendees with 700 cars came to Pittsburgh, PA to experience a full week of social gatherings, driving activities, car shows, technical seminars and good ‘ol BMW car talk. Scroll through the interactive recap for more. Continuing the activation from 2017, Shell was the primary sponsor of the Time, Speed, Distance (TSD) competition and Fun Rally, both popular driving events for the members. 40 members joined along for the TSD Rally and Shell provided $1,500 in total gas card awards to the TSD Rally class winners. The influencers in attendance all came to watch the start and learn a little more about what a TSD rally is. The route covered 80 miles of surrounding roads and lasted approximately 3 hours. A straightforward touring rally is a TSD event in which the rally master provides all the information you need in order to calculate the time you should reach any point on the route. If you don’t care for math, then you can enjoy the tour and just try to drive close to the assigned average speeds; you will be surprised to find how well you do compared to others who worked furiously with their iPads and calculators! In fact, rally organizers usually assign classes to rallyists with various types of equipment. The Fun Rally is a simple, follow-instructions-and-answer-questions rally that members will take during the week at their leisure. The route took BMW CCA members to local hot spots and historical sites around the Pittsburgh area. Tuesday afternoon was the first-ever Influencer Social Media Panel – Presented by Shell V-Power NiTRO+. The intent of the panel was to educate members on what an “influencer” really is and does, and how the social media space has become so significant on so many levels and that there are professionals who make a living producing content. 70 members came to the panel discussion and a few region communications people had good questions on how to do a better job with their local club. After the panel discussion, the Shell V-Power NiTRO+ reception took place in the partner display room from 3pm to 5pm. Shell sponsored the event and had influencer Samantha Tan and Nick Wittmer, Sam’s co driver, sign autographs at the Shell booth. All of the influencers were on hand to engage with members and follow up on questions from the Panel discussion. On Wednesday, it was Concours d'Elegance day at Heinz Field. 120 significant and historic BMW’s convened on the stadium grounds for the Pirelli Concours d'Elegance. Three levels of preparedness make up the judging and is a highlight of O’Fest. This was a great opportunity for the influencers to capture social content and meet with members and the car owners. Congratulations to National Capital Chapter member @wolf_the_f82 our latest Shell Fill-Up Friday winner! Want to win a $25 Shell Gift Card? Every Friday, Shell and the BMW CCA will be awarding a BMW CCA member a $25 Shell V-Power NiTRO+ gift card. For a chance to win, all you have to do is post a picture to Instagram of your car being fueled up at Shell with the hashtags #fillupfriday, #bmwccashell, #fuelrewards, and #shell_ontheroad. We’ll announce the winner on Instagram, Facebook, and BimmerLife every Friday. Good luck, everyone! Their content and posts from all the activities provided some unique and SVPN+ associations that were well received by their followers. When the influencer are together, they always talk about how to be better ambassadors and like discussing the business with each other. They appreciate the invitation from Shell that gives them that opportunity. We also leveraged the local Shell station for Spencer Burke to host a subscriber meet up where he could connect with his most loyal followers and share more about what he was up to with Shell and the BMW CCA. See his post below. Having our influencers at the event and engaging BMW CCA members drove visits to the stations, sparked additional content, produced fill-ups and even brought our local friend Autovlog out to the meetup at the Baum Blvd. Shell station nearby. Quick subscriber meet up tomorrow Monday 9AM!! I’ll be at the @shell gas station at 5735 Baum Blvd, Pittsburgh PA and meeting up with @spencerberke He’s giving away FREE gas cards to the first 20 people who make it out there! If you don’t care about gasoline and maybe drive a Tesla or something come and say hello anyway! Congratulations to @bmwccala chapter member @handmadeshifts our latest Shell Fill-Up Friday winner! “Wow, this is a great surprise! I’ve been a BMW CCA member since I got the M2,” says Jade. “The discounts offered for the BMW performance driving school alone makes the membership worth it. Regular events and meetings sponsored by the BMW CCA make my BMW life a much more enjoyable experience!” ———————————————-Want to win a $25 Shell Gift Card? ———————————————Every Friday, Shell and the BMW CCA will be awarding a BMW CCA member a $25 Shell V-Power NiTRO+ gift card. For a chance to win, all you have to do is post a picture to Instagram of your car being fueled up at Shell with the hashtags #fillupfriday, #bmwccashell, #fuelrewards, and #shell_ontheroad. We’ll announce the winner on Instagram, Facebook, and BimmerLife every Friday. Good luck, everyone! YouTube call out with @autovlog and @spencerberke at shell gas station in Pittsburgh!!! BMW CCA leveraged the opportunity to partner with the Pittsburgh Vintage Grand Prix to help promote attendance and exposure for the partners. The club hosted a 400 person hospitality tent for members in a special BMW corral at the race track. Shell sponsored or supported many programs to engage the membership. From social to driving events, the first few days of O’Fest was Shell focused, from branding to member engagement. Shell also receives a prime footprint at the host hotel. The gathering place for members and partners, this area provides the opportunity for members to visit partner booths and show case product stories, provide collateral and engage in discussions. The Shell booth featured the Latest Shell V-Power BTL and we gave away the popular Shell cooling towels. We provided directions to the closest, and most presentable Shell station, which was eight miles away. A continuingly popular contest Shell does for the members is the Shell receipt contest. Members can win $250 or $100 in a random drawing by submitting their receipts at our booth. The receipts have to be within seven days, promoting Shell fill ups on their way to O'Fest. 98% of receipts were SVPN+ fill ups. 207 receipts were collected, representing an estimated 2,800 gallons of V-Power (and thats just from those who entered their receipts). Shell also presented a $250 Shell gas card to a member who drove from Seattle all the way to Pittsburgh for the event. Shell organized the featured panel discussion: Inside the Life Of Automotive Influencers – Presented by Shell V-Power NiTRO. The social media panel included our influencer representatives and included questions and content about the significance and success of social media in the automotive world. Shell sponsored the reception after the panel where Samantha Tan and her co-driver Nick Wittmer, were available to sign autographs at the Shell booth. We also had our influencers on hand to engage with the members. We leveraged gas cards as random prizes and incentive to attend the panel. As a BMW member incentive, we collected Shell receipts for a chance to win $250 in Shell gift cards. Since participation has been historically high, we also awarded a $100 card to a second member. Members wrote their BMW member number on the back of the receipt and one winner was chosen and announced at the banquet. Shell also provided $250 in gas cards to the member who drove the farthest to attend O’Fest. Shell sponsored the Shell V-Power NiTRO+ TSD Rally on Tuesday morning. A true driving event, Shell provided $1,500 in gas card prizes to drivers and navigators for those who place in three classes. Shell V-Power NiTRO+ sponsored the member “fun” rallies. A non-structured, casual driving tour through the local region. Shell was the presenter of the Tuesday night BMW CCA Shell River Cruise Dinner on the river boat. Shell provided $150 in gas cards to three people’s choice winners of the costume competition (Gilligan’s Island theme). Matt Maranowski hosted a subscriber/follower meet-up Wednesday morning at 11am at the Concours d'Elegance event by Heinz Field. He gave away (6) $25 Shell gas cards. Spencer Berke hosted a meet and greet meet up at the Shell station located at 5735 Baum Blvd. in Pittsburgh from 9-11am on Monday, July 9. Spencer handed out 20 Shell gas cards to those who came by to spend time. Copyright of Shell International. Metric support from Edelman. Photos from Sport Dimensions and Samantha Tan. Information and website produced by Sport Dimensions.